Does the top shot of the sitting on the suitcase emphasise the particular posture and specifically the hips in a more direct way than if shot frontally? And similarly, does the frontal only very slightly elevated shot of the specific section of the person in the foreground ‘propose’ a light swiping and/or 'graspable' proximity? Is the combination of the two shots believable and does one enhance the other? How does it feel to combine those orientations when watching? — Derrida, "The Animal That Therefore I Am" p8. Before the body fell it was standing on three, two legs? And then it was only on one for a split second. One point, all weight distributed here, not quite. And it tips over. And caught, as a reaction or as a response? Caught by the body or the other? This body. And it doesn’t speak? It is not silent as it is moving, it did not seize to move. Only for a split second did it show that reaction. For a split second it surrendered? But then it caught itself and which moment was louder? Which a response to ? The body moves. Its lungs move. Falling up? One body is silent, or is it quiet? And it is alone but not actually. Another body is approaching from behind the first. This takes a long time. When very close the second body disappears behind the first body. Then the left arm reaches around the other body from behind and opens it up from the chest down to the stomach. Now that the first body is open the second body behind the first body is visible through the first body. And the right hand of the body behind is touching the back of the first body with the palm of its hand but the back is invisible so it is touching that which is missing that which might seem like the back of the first body because there is a surface. The surface is visible through the palm of the hand. It touches, the skin is pressing against. Invisible although it is quite clear that it is the back of the first body because of the positioning of the two. There is a reaction in the back. And then after a while there is a response? Or is it a reaction that is triggered by something later in time? It might be a reaction but the intensity of the reaction the arch of the gesture is maybe too wide and maybe too slow as well? And it drops, the whole body drops in the middle of it. And gets up again? Accidentally? Then the reaction might, despite the long and slow execution — might have been a reaction and not a response. Or was it part of it? Was that part of a response? An accident that only seemed like an accident for someone who thinks it might have been a response. An accident. It is pulling back. Pulling back further and rapidly leading the move from the neck in succession reaching the legs and they are being pushed back, moving it back. And again, but slightly different. Always slightly different. That is why it speaks? Through a reaction as through the response. Speaks? Makes another move. And the other moves. Follows it by drawing back, because it knows how to pull it closer. And it pulls it closer by changing the distance to the exact distance, by moving away. It isn’t distracted and not distracted by arms or fingers that is why the neck takes the lead. And does it marvel at ? now? Its second eye is capturing the tension from slightly below and inward moving in more closely while the other second eye is in a position to see both over shoulder but it reaches around the axis of the other, the vertical one. The horizontal is in half. 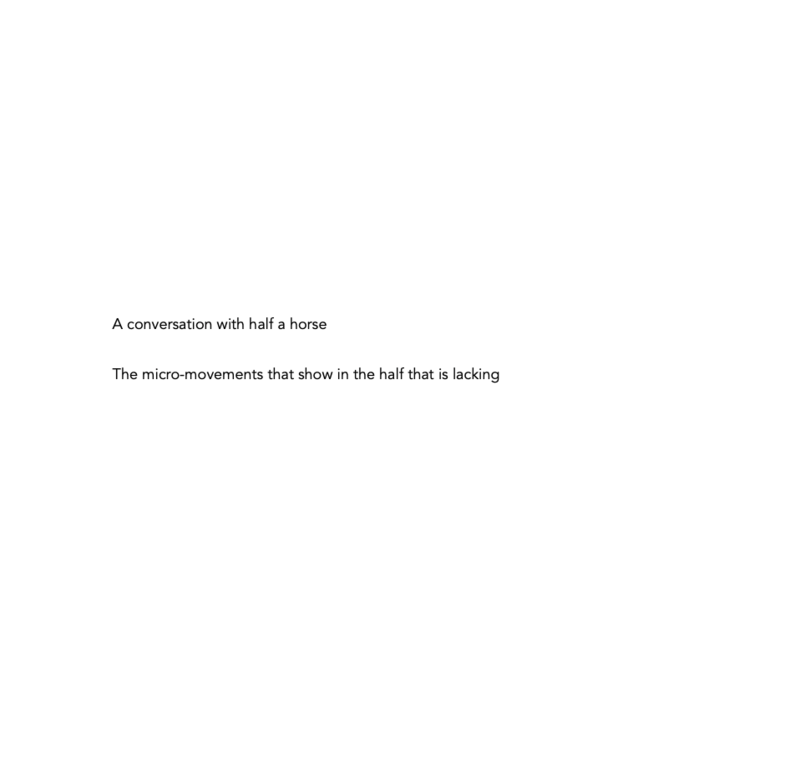 Half a horse.